L: 91" x W: 67" x H: 64"
Quinn Queen Storage Bed Elevate the style of your bedroom with this Quinn queen storage bed. The frame is fully upholstered in a rich, luxurious chenille and features diamond button-tufting and nailhead trim. Plus, the added bonus of storage makes this bed a great choice that's both functional and stylish. Elevate the style of your bedroom with this Quinn queen storage bed. The frame is fully upholstered in a rich, luxurious chenille and features diamond button-tufting and nailhead trim. Plus, the added bonus of storage makes this bed a great choice that's both functional and stylish. 1 drawer L: 29"" X W: 15"" X H: 8"
This bed is better than what I wanted!!! It is beautiful and so elegant whoa!!! I love the bed frame. But the only problem I have is that the draw doesn't close. Hello Ebony, we're sorry you are experiencing issues with you purchase. If you would please send your order details, contact information and a copy of your concerns to rfcare@raymourflanigan.com we'd love to see how we can help. Beautiful bed. classic chic style... similar to what would couse 4x as much in a “trendier” store. Neutral color that goes with most everything. Speedy delivery. This bed is incredibly cozy and fits great in our space. The best part is the hidden storage, you cannot even tell that the front opens up to two drawers! Beautiful bed! Storage is a plus!! Raymour delivery was great as always, delivered 3 days after online purchase. Bed is great and my mother in law loves it. Who could ask for more! 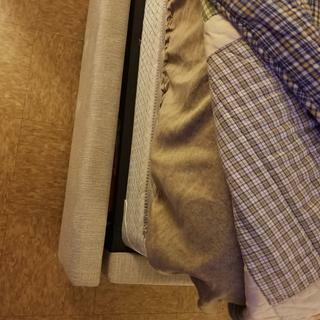 the mattress and the bed’s side railings (clothy material) is excessive showing the adjustable bed apparatus and clothing stored in the drawer. Very unsightly! Hi Michael, sorry to hear about your adjustable base not fitting well with this bed. If you would please send your order details, contact information and a copy of your concerns to rfcare@raymourflanigan.com we'd love to see how we can help. 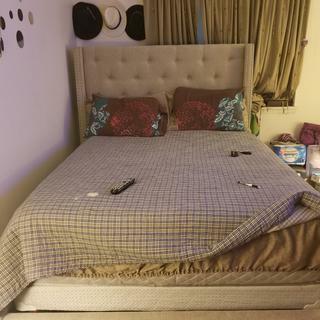 Can this bed be used with a power base queen size that I have previously purchased? BEST ANSWER: Hello Scott, thank you for your interest in the Quinn Queen Storage Bed! 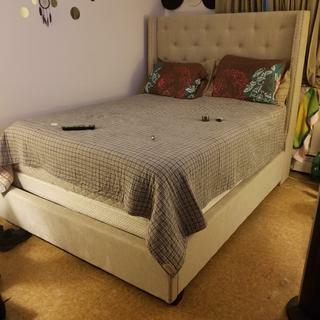 Unfortunately, this bed cannot be used with a regular adjustable base because it is a platform and would require a adjustable base specifically designed for that type of bed frame. We offer a variety of beds both upholstered or wood. Our online sales department would be happy to make suggestions and find a piece similar to the Quinn. Please contact 866.383.4484, option 2! No, you can’t because this is a platform bed that has a single drawer that runs the width of the bed at your feet/foot board.